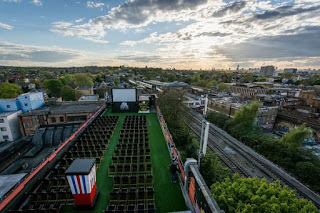 The Rooftop Film Club has announced its Summer 2016 programme of open air screenings, back on the rooftops that gave it its name. As in 2015, there are four venues for the summer, The Queen of Hoxton in Shoreditch, The Bussey Building in Peckham, Roof East in Stratford, and Kensington Roof Gardens, wth food from Forza Win and RockaDollar Dogs, plus coffee from sponsors Nespresso. Films are shown on a big screen, and the audience is given wireless headphones for the sound. It runs until September, and more films will be added - Note that films sell out fast! 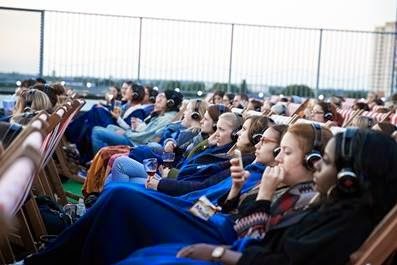 "London’s favourite skyward cinephiles, Rooftop Film Club, are once again bringing their own brand of movie magic to the city’s iconic skyline. This summer, Rooftop Film Club presented by Nespresso, will be bigger than ever before, serving-up cult and classic movies across four of London’s finest rooftops, as well as a sizzling line-up of Hollywood blockbusters fresh from the editing suite. This year, film-loving Londoners can indulge their inner foodie with bespoke menus from two of London’s most exciting pop-ups, lauded Italian supper club, Forza Win, and Hawksmoor Knightsbridge Head Chef Richard Sandiford’s solo venture, RockaDollar Dogs. Nespresso will be on hand to serve up some top quality coffee cocktail classics, including the ultimate Nespresso Martini, plus there will be some delectable summer cocktails whipped up by the Spirted Mixers team." Kensington Roof Gardens - Coming soon!